A little rain did not stop the Wings of Hope organization from having its scheduled burial service at Calvary Cemetery on Thursday evening, May 10th. Father Tim Reker and Deacon John Rudd from St. Joseph the Worker Catholic Church carried on undeterred by the light but cold rainfall. About 15 people took part in the ceremony, and live music was provided. Wings of Hope hosts burial services for children lost during pregnancy. 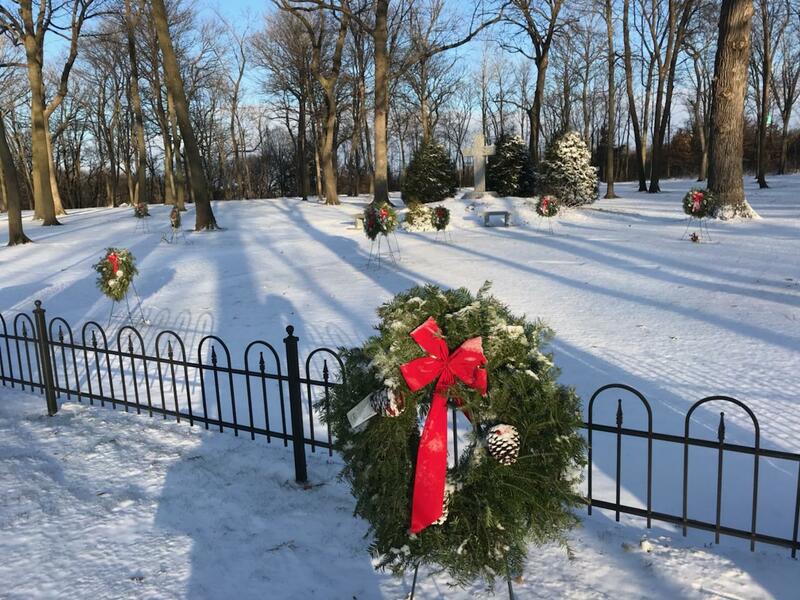 A special section of the cemetery was developed and dedicated for this purpose recently — articles about the WOH site development and dedication are available on this blog. The Wings of Hope website is located at http://www.wingsofhopemankato.com. 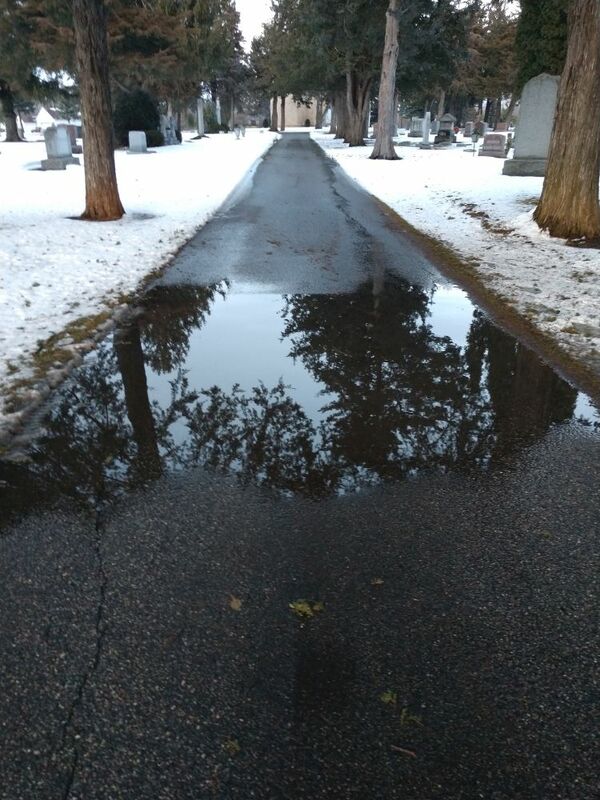 The on-again, off-again spring and recurrent heavy snowfalls have slowed the annual spring clean up at Calvary Cemetery, reports Terry Miller, Caretaker. Of course, Memorial Day is the biggest day of the year at Calvary in terms of visitors and activity. Terry also reports the frost is still deep in shady areas and the north side of buildings where the spring sunshine hasn’t warmed the ground or melted the snow cover. No one who visits Calvary Cemetery can fail to notice “The Kron Angel.” Estimated at 24,000 pounds of imported Belgium stone and situated close to the central chapel, this massive monument commands attention. So who is buried under this landmark? 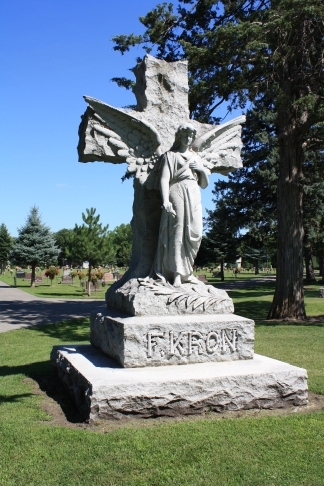 This monument marks the final resting place of Frederick Kron, a prosperous and well-known Mankato merchant who was buried at Calvary on February 5, 1917 after dying at St. Joseph’s Hospital on February 1st. He was 64 when he died of “acute kidney trouble” following a week of fever and chills. Frederick Kron was born in Milwaukee, Wisconsin on August 9, 1852, and arrived in Mankato with his parents, Johanna and Clement Kron on July 24, 1853, just one year after the town was officially “settled.” According to Mankato: The First 50 Years, a historical account published in 1903 by The Free Press Printing Company, Clement Kron first opened a tavern, then established Mankato’s first hotel, Kron’s hotel or “The Minnesota House,” which was described as originally a simple log house. Clement died in 1873 and Fred assumed management for two years. 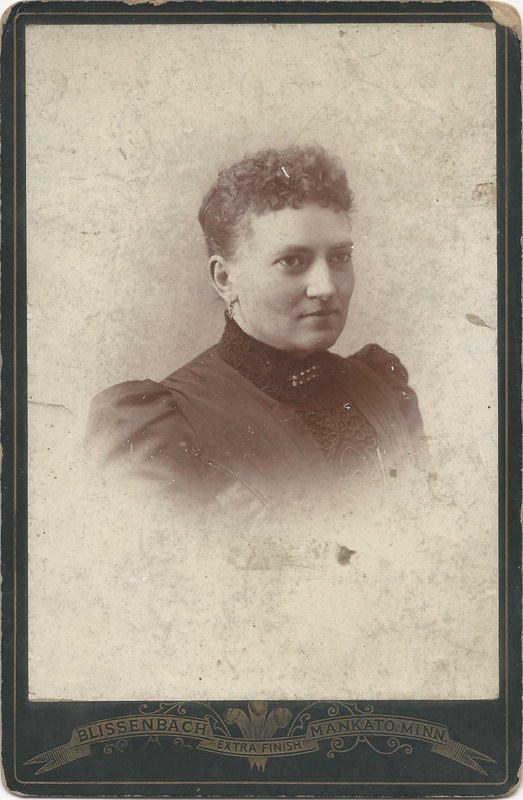 Shortly after that, on May 19, 1874, Fred married Clara, the daughter of Mathias Ulman, described in Fred’s Mankato Review obituary as “one of the pioneer hotel keepers of Mankato. The Minnesota House was later leased and eventually sold to Joseph Stahl, Fred’s brother-in-law. The Minnesota House was eventually torn down and a brick hotel, The Stahl House, was built. Fred opened a general merchandise store at 309 North Front Street and ran it for 10 years, according to his obituary. Pallbearers included Mankato Mayor Robert Lamm, James E. Hickey, F.K. Meagher, John H. Hohmann, Joseph Thro, H.F. Leonard and Otto Lamm. Honorary pallbearers were the director of the Mankato State Bank. Fred was president of the bank at the time of his death. A Mankato Review article dated February 7, 1917 focused on the probate of Fred’s estate. Details included his financial holdings: Town and city property valued at $36,000; farm property valued at $4,000; personal property, $60,000; and $40,000 in “rents and profits.” According to one online currency calculator that $140,000 would equate to $2.6 million in today’s dollars. 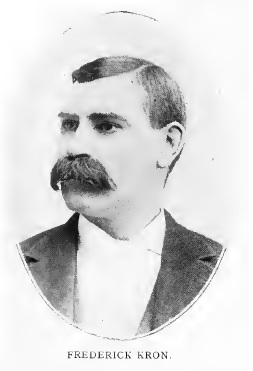 The Encyclopedia of Biography of Minnesota (online version, published in 1900 by The Century Publishing and Engraving Company of Chicago), has a section on Frederick Kron. According to the biography, Fred and Clara had no children. Since Clara (shown left) died before Fred on June 29, 1910 at the age of 55, the proceeds of his estate were directed to his mother who survived him. There was some controversy regarding Fred Kron’s will…or lack of one. A newspaper account at the time noted that “some say” that they overhead Fred and Clara talking about making or having wills while there was other hearsay that Fred had said the wills had been destroyed. That Fred’s mother, Johanna, claimed that her son, the merchant prince, died intestate, produced some local controversy. At the time of this post, no subsequent article has been found that a will was ever produced, and no reference found about who exactly ordered the lavish Kron Angel monument. It’s easily possible that Fred ordered it after his wife’s death, and the monument was already installed at the time of his death. Any additions or clarifications to this account are welcome! The unseasonably warm weather of the last few days has Calvary Caretaker Terry Miller hoping for some continued relief from the subzero blitz that has made January 2018 a tough month. The combination of no snow cover and numbing subzero has dropped the frost down 16 inches deep. That basically turns the ground to stone-like hardness, making it necessary to heat a site for 24 hours prior to excavation. Today’s forecast for snow has him hopeful. “I still wish we would get a good foot of snow. Not only would it keep the frost from going down further, it would maybe take some out,” he said. The threat of a blizzard has closed Mankato area schools today. That forecast could well bring the snow Terry is hoping for. 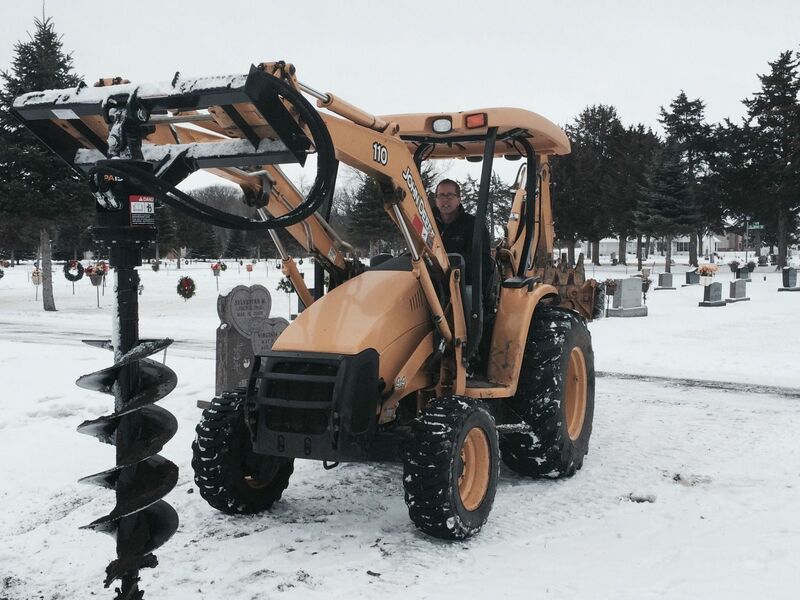 Bitter cold makes for tough working conditions at a cemetery. Machinery has to be kept running longer to keep it starting reliably, and the frozen ground means three hours of prep and 24 hours of heating added to the normal excavation work load. “But I will say the auger we purchased a few years ago is great. The carbide blades will go through approximately one inch of frost per minute,” he explained. Since Dickens and A Christmas Carol all Christendom has recognized that, while fashion, attitude and politics change, Christmas marks the time. We all remember from one Christmas to the next. That first Christmas with the new baby. That last Christmas with a grandparent. We remember our little traditions, sometimes handed down from parents and grandparents, or even those from the lands our great-great-great grandparents came from. Christmas Present gets its savor from Christmas Past. It is our most celebrated and revered season. And those seasons we remember and remember each December, ever measuring this year’s vintage against the treasured tastes of bygone yules. In that savoring, it is hard not to remember those no longer with us while we sit around our festive holiday tables. That favorite great aunt, treasured grandparent or especially close cousin…we see glimpses of them laughing by the fireplace or see a special ornament of theirs on this year’s tree. But the sharpest stabs of nostalgia, the ones so painfully poignant, come from the absence of parents, children, brothers, sisters or spouses…those we once shared each day with in bouts of triumph, sickness, chores and just the ebb and flow of daily life. Christmas has the power for great joy but also for great sorrow. As we celebrate the Birth of Our Savior this day, remember that His sacrifice at the original Calvary conquered eternal death. We hope your memories of Christmas Past bring you joy this season. That’s one of the messages that Calvary Caretaker Terry Miller shared with Catholic cemetery caretakers and board members from across the diocese during workshops held this month. Although there are over 100 Catholic cemeteries in the 20 southern Minnesota counties that encompass the Winona Diocese, Terry is one of the few full-time, professional caretakers. On average the other cemeteries in the diocese average 3.2 burials per year while Calvary averages close to 100 per year. While there are some larger cemeteries in the diocese, Calvary is the largest in terms of acreage under maintenance. 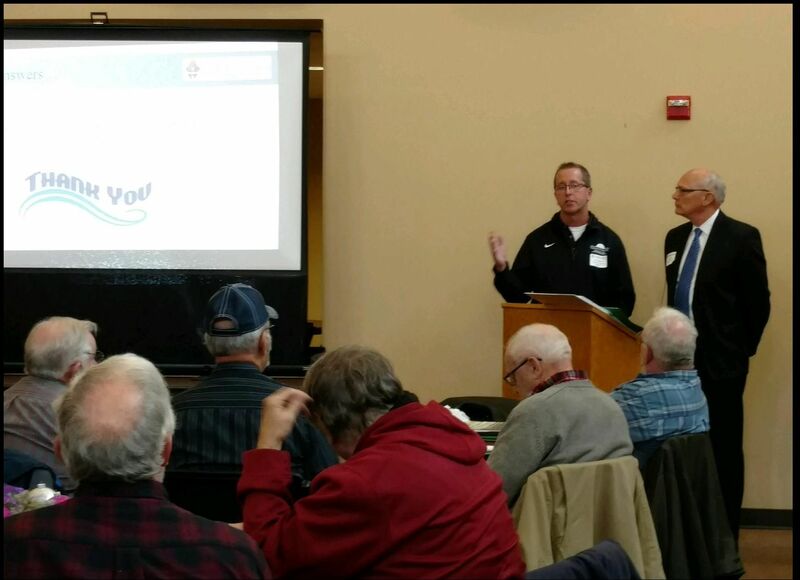 Because of his experience, Terry was invited to be one of the speakers at the workshops, and appeared in Adrian and Owatonna to share his views. He was also accompanied by one of the Calvary board members, Father Tim Reker, pastor of St. Joseph the Worker parish. Attendees consisted mainly of cemetery caretakers, volunteers and clergy. Terry shared the tactics that he and his board have advanced at Calvary in order to ensure “perpetual care” of the cemetery for future generations. Topics included pricing, board involvement and advocacy, community and parish support, the use of social media, client service, and fundraising. Terry reported that his sharing was well received.